Under the arrangement, the city would pay an estimated $7.1 million upfront to acquire and demolish properties, relocate utilities, and perform an environmental cleanup, according to a city memorandum. That contrasts with the city’s original offer—a 15-year, $6.1 million, pay-as-you-go TIF deal plus $1.9 million in upfront costs for an $8 million city investment. Pay-as-you-go TIF deals are standard for many municipalities. Cities reimburse a portion of the developer’s annual property taxes for the deal’s duration to help the developer recover costs. Blackhawk’s proposed headquarters, known as Reflections Plaza, would be located along the eastern shore of the Rock River, sandwiched between East Court Street and Hedberg Public Library. It would be a multipurpose building with room for other tenants. Blackhawk CEO Sherri Stumpf said the company’s new request is not a “nontraditional” incentive. The city often pays to acquire and demolish buildings, and it has already done so on this site—paying $750,000 to buy and raze the former Mercy Options building at 20 E. Court St. When discussions between Blackhawk and Janesville officials began in early 2018, the credit union originally intended to buy several privately owned parcels, according to the memo. But last month, Blackhawk said it wanted the city to buy the former Rock County Jail site, the vacant Bee Line Wheel Alignment building and the functioning Nowlan and Mouat law firm, according to the memo. Nowlan and Mouat is aware it could be forced to move, Deputy City Manager Ryan McCue wrote in an email to The Gazette. Acquiring those three properties would cost $4.25 million. The city still would be on the hook for demolition, environmental cleanup and utility relocation, like it originally offered Blackhawk. But it would pay more interest on debt to finance the added upfront costs, according to the memo. Janesville would sell those parcels and others it already owns to the credit union for $1. Stumpf served on an early committee for ARISE, a public-private effort to revitalize downtown. The ARISE plan listed this site as one where the city would help finance its preparation for development, she said. Blackhawk is not responsible for any contaminants found on the site, so it believes the city should get it ready, she said. 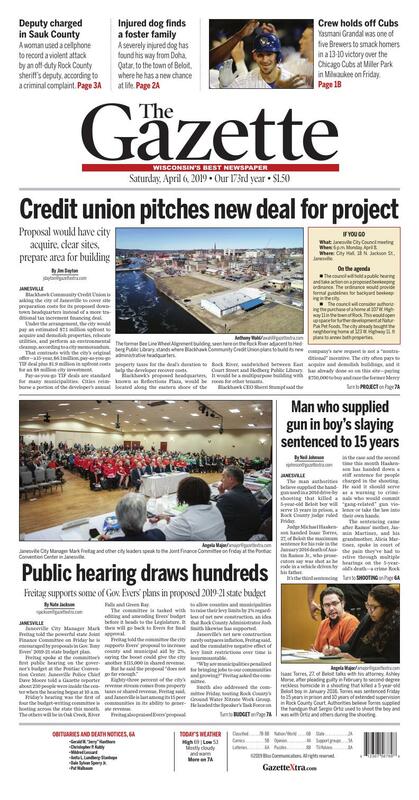 The credit union could choose to locate the project elsewhere, but it sees downtown as a place where its construction could spark further revival, she said. McCue said city officials could not recall an upfront package for as much as $7 million. City council President Doug Marklein and Vice President Tom Wolfe both said they had not formed opinions on Blackhawk’s idea. Neither could recall a previous incentive that eschewed tax breaks for upfront financing. The council will discuss the deal Monday night. It is not an action item; the council will only provide guidance to city officials for the next step. Wolfe said having an early discussion will increase transparency before the council takes future action. Marklein said he was “intrigued” by the idea and praised the outside-the-box thinking. There’s more than one way to make the project happen, he said. In Blackhawk’s eyes, the new request makes the project as simple as possible. Janesville readies the site, and the credit union focuses on construction, Stumpf said. “We knew it was going to be complicated,” she said. “But I think if everybody does the area that’s their expertise, isn’t that the best of both worlds? The city does this every day. They have professionals who do this for a living. When: 6 p.m. Monday, April 8. Where: City Hall, 18 N. Jackson St., Janesville. The council will hold a public hearing and take action on a proposed beekeeping ordinance. The ordinance would provide formal guidelines for backyard beekeeping in the city. The council will consider authorizing the purchase of a home at 107 W. Highway 11 in the town of Rock. This would open up space for further development at NaturPak Pet Foods. The city already bought the neighboring home at 123 W. Highway 11. It plans to annex both properties. Janesville City Manager Mark Freitag and other city leaders speak to the Joint Finance Committee on Friday at the Pontiac Convention Center in Janesville. Janesville City Manager Mark Freitag shares his thoughts on Gov. Tony Evers’ proposed 2019-21 budget with the Joint Finance Committee on Friday at the Pontiac Convention Center in Janesville. State Sen. Alberta Darling, R-River Hills, center, speaks to a roomful of hearing attendees Friday at the Pontiac Convention Center in Janesville. AARP advocate Susan Fadness speaks to the Joint Finance Committee about health care concerns Friday at Janesville’s Pontiac Convention Center. State Sen. Janis Ringhand, D-Evansville, introduces herself at the beginning of the budget hearing while sitting with the rest of the Joint Finance Committee on Friday at the Pontiac Convention Center in Janesville. Chris Bladl, vice president of product development at Prent Corp., right, gives a tour of the company’s Janesville facility to members of the Joint Finance Committee on Friday. Chris Bladl, vice president of product development at Prent Corp., center, shows molds for creating packaging to members of the Joint Finance Committee during a tour of the Janesville company Friday. Chris Bladl, vice president of product development at Prent Corp., shows members of the Joint Finance Committee a block of synthetic wood used for prototyping Friday at Prent’s Janesville facility. Janesville City Manager Mark Freitag told the powerful state Joint Finance Committee on Friday he is encouraged by proposals in Gov. Tony Evers’ 2019-21 state budget plan. Freitag spoke at the committee’s first public hearing on the governor’s budget at the Pontiac Convention Center. Janesville Police Chief Dave Moore told a Gazette reporter about 250 people were inside the center when the hearing began at 10 a.m.
Friday’s hearing was the first of four the budget-writing committee is hosting across the state this month. The others will be in Oak Creek, River Falls and Green Bay. The committee is tasked with editing and amending Evers’ budget before it heads to the Legislature. It then will go back to Evers for final approval. Freitag told the committee the city supports Evers’ proposal to increase county and municipal aid by 2%, saying the boost could give the city another $115,000 in shared revenue. Eighty-three percent of the city’s revenue stream comes from property taxes or shared revenue, Freitag said, and Janesville is last among its 15 peer communities in its ability to generate revenue. Freitag also praised Evers’ proposal to allow counties and municipalities to raise their levy limits by 2% regardless of net new construction, an idea that Rock County Administrator Josh Smith likewise has supported. Janesville’s net new construction rarely outpaces inflation, Freitag said, and the cumulative negative effect of levy limit restrictions over time is insurmountable. “Why are municipalities penalized for bringing jobs to our communities and growing?” Freitag asked the committee. Smith also addressed the committee Friday, touting Rock County’s Ground Water Nitrate Work Group. He lauded the Speaker’s Task Force on Water Quality and Evers’ call to make 2019 the year of clean drinking water. Smith said the opioid epidemic continues to disproportionately affect area children. In the last five years, he said, the number of children in out-of-home placement has doubled, and Rock County’s contribution to child welfare has increased by 70%. Evers has proposed a $15 million hike in the Children and Family Aids allocation. State Rep. Amy Loudenbeck, R-Clinton, is vice chairwoman of the committee. State Reps. Deb Kolste of Janesville, Don Vruwink of Milton and Mark Spreitzer of Beloit and state Sen. Janis Ringhand of Evansville—all Democrats—also attended the hearing. At noon, Ringhand and Spreitzer joined a press conference held by Citizen Action of Wisconsin outside the convention center. They urged the committee to accept more federal Medicaid dollars to expand BadgerCare Plus, which Evers has proposed in his budget. That would save the state about $324 million, they said. “This is not a partisan issue. It’s not Democratic or Republican, and we just need to adopt the expansion because it greatly benefits all of our citizens,” Ringhand said. In an interview with The Gazette, Loudenbeck said Evers’ proposal allowing local governments to raise their levy limits by 2% would have trouble gaining traction in the Legislature. The tax increases will start adding up, she said, and residents generally have been satisfied with declining taxes over the past six years. She said she is “skeptical” about expanding Medicaid but said the state should look at raising Medicaid reimbursement rates to providers. Loudenbeck praised the Janesville community Friday, saying the introductions from city and county officials to the committee were welcoming, and she applauded the turnout. Establishing an Office of Sustainability and Clean Energy. Allowing undocumented immigrants to obtain state driver’s licenses. Rock County Sheriff Troy Knudson was one of the last people to speak around 5:45 p.m. He told the committee there is a “serious lack of treatment locally” for drug addiction, particularly inpatient treatment. He also said the state should look at temporary housing for people being released from custody. In an interview after the event, Kolste echoed Loudenbeck, saying the event was “fabulous” and well-run.